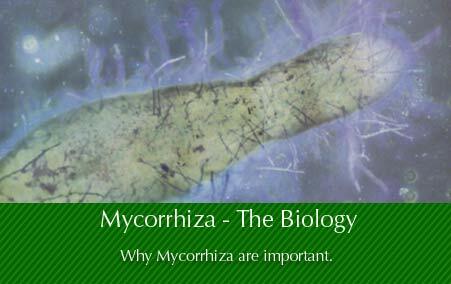 A Study - What are Mycorrhiza and why are they important? A mycorrhiza is what is formed when a fungus and a plant root combine. This combination is termed a mycorrhizal association. It is important to understand that a mycorrhiza is neither a root nor a fungus but a distinct and separate entity that is created by the coming together of the two. The fungus grows with the root and behaves in every way as if it is actually an external tissue of the root. It is literally a ‘fungus root’ derived from the combination of two Greek words; mykes = mushroom or fungus and rhiza = root. Further to this the fungus part of the mycorrhizae also grows out a very fine network of cotton-like strands, almost like roots themselves. This network consists of individual strands called hyphae. These strands of hyphae collectively form a huge network termed a mycelium network. This mycelium network is easily seen by turning over rotting leaves in a woodland. The mycelium network is the white velvety coating on the rotting vegetation; the larger strands are the mycelium. The association between the fungus and the root is a symbiotic one, in which both the plant and the fungus benefits from the relationship. The fungus has a relatively constant and direct access to sugars produced by the plant in photosynthesis, such as glucose. In return, the plant gains the use of the mycelium's extremely large surface area to absorb water and inorganic mineral nutrients from the soil. 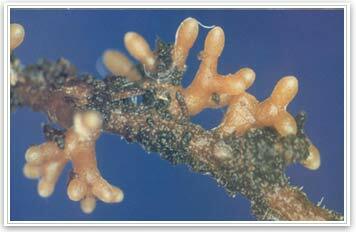 The mycorrhizal fungus coating the root also provide a protection against external disease causing pathogens. It has been stated that a tree gives up 25% of its products of photosynthesis to the fungus to maintain the mycorrhizal association. But this is much less energy than it would be required to use if it tried to establish a comparable network of fibrous roots. The close association of the roots of trees with certain fungi was described as long ago as 1885 by a German forester, Albert Bernhard Frank in a paper called “On the Nourishment of Trees through a Root Symbiosis with Underground Fungi (1885)”. However it is only within the last 30 years that scientists have begun to realise that far from being the exception, such relationships are actually the norm in the plant kingdom. Research has shown that in the wild, more than 95 percent of higher plant species have this fungal association occurring within their root systems. There are exceptions, notably brassicas, such as cabbages, and poppies among others. Phosphate is essential for plants it is used in the healthy growth of roots. Plants, it seems, are incapable of taking up phosphate in the soil alone. However the mycelium of the mycorrhizal fungus can access this locked up phosphorus and make them available to the plants that they are colonizing. 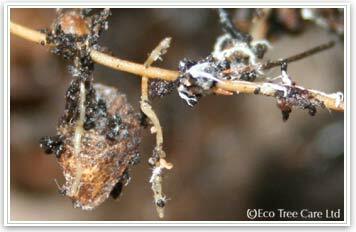 Mycorrhizae are especially beneficial for plants in nutrient-poor soils. They are able to cover a much larger range than the roots and so can find the relatively low concentration of nutrients that are present and make these available to the plant. Some trees are ‘obligate’. They must have a mycorrhizal association to survive. E.g. Oaks, beech, pine. It is thought that when these obligate species start to germinate, the energy contained within the seed is enough to sustain them for the initial growth into sapling trees. If by the time that this energy store is exhausted they have not entered into a mycorrhizal association with a beneficial fungus then they will gradually weaken and die. Others are ‘facultative’. They don’t require an association but grow much better with it. E.g. Birch, aspen, maples. Facultative tree species are commonly the pioneer species, meaning those trees which are capable of colonising new areas, thus setting up a woodland environment ready for the obligate species to move in. Under less-than-ideal conditions, studies have shown that the efficiency of mycorrhizal roots can make the difference between life and death. Plants with mycorrhizal root systems are better able to resist stresses such as drought, heat, and even diseases. Trees with an established mycorrhizal association are likely to be more resistant to disease because of the greater supply of nutrients and also that the mycorrhiza already occupy areas on the root that otherwise may be openly vulnerable to pathogenic organisms. It is also reported that many mycorrhizal fungi secrete antibiotics, protecting roots from pathogenic fungi such as Phytophthora and Armillaria, nematodes (small invasive worms) and bacteria. In a mycorrhizal association the fungus may colonize the roots of a host plant either intracellularly or extracellularly, as explained below. 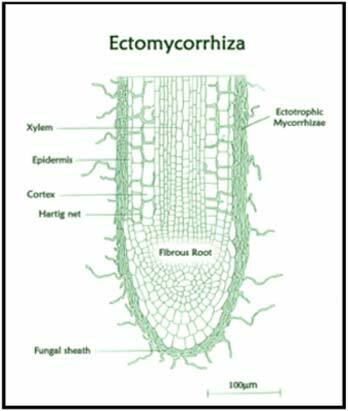 There are basically two distinguishable types of mycorrhizal fungi; ectomycorrhizae (EM) and endomycorrhizae (AM). 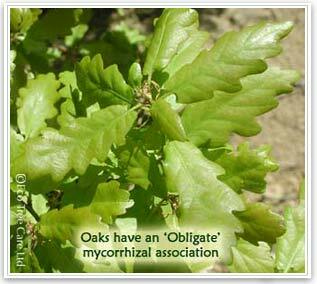 They have associations with different plant species. With trees, the most common types are ectomycorrhizae or EM. 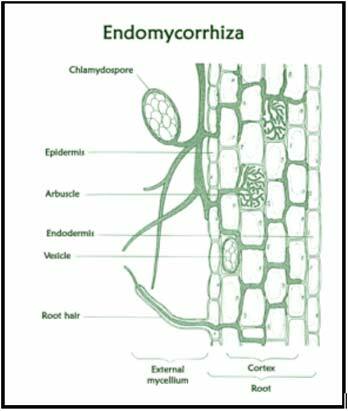 Ectomycorrhizae means that most of its structure is outside the cells of the root (extracellularly). 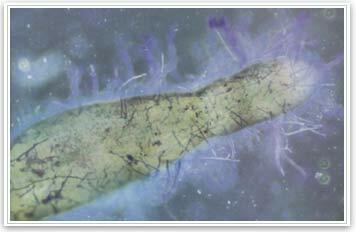 The mycorrhizae form a visible sheath over the surface of the roots with hyphae which grow into the tree root but in between the cells. These hyphae form a characteristic structure known as a Hartig net. The hyphae do not physically penetrate the cell membrane. Most EM fungi also produce fruiting structures like mushrooms and puffballs. The other major type is endomycorrhizae which have most of their structure inside the root, also known as arbuscular mycorrhizae or AM. They are more primitive fungi than the EM type, making up only 150 of the estimated 6,000 mycorrhizal fungi species. However, AM fungi is the most abundant found on 65 percent of plant families, including grasses, herbaceous plants and woody species, with most colonising a wide range of plants. Endomycorrhizae are rare in deciduous trees, but do occur in some conifers (Thuja, Cypress, Juniper, Redwood, Swamp cypress). 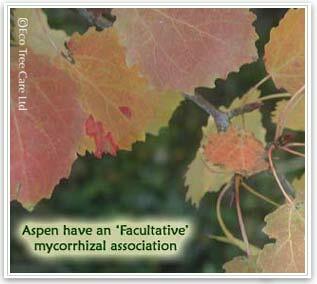 The arbuscule is a part of the fungus that is tree-like in structure and penetrates the cell walls of the root. The result is a large surface area across which the plant and fungus can exchange substances to mutual benefit. The hyphae do not actually penetrate the cell membrane but they do ‘invaginate’ the cell wall. Their microscopic structure makes AM fungi difficult to see and they do not form above-ground fruiting bodies. For this reason they were missed by Albert Frank initially having been discovered more recently. More than 90% of vascular plants are thought to associate regularly with them. Clearly, Mycorrhiza play an essential role in plant survival. It is for this reason that when planting trees, either as single tree planting, a woodland planting scheme or a native hedge planting project it is highly beneficial to introduce mycorrhiza directly to the roots and the soil so that the mycorrhizal association can occur immediately - this technique is called mycorrhizal inoculation.